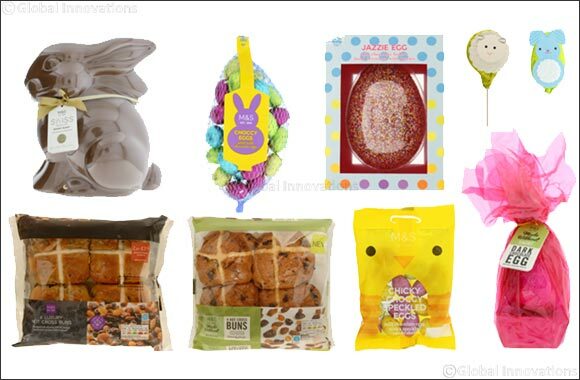 Dubai, UAE, March 19, 2019: Celebrate Easter in style with Marks & Spencer's luxurious chocolate eggs and delicious hot cross buns. Choose from the mouth-watering 1 kg Swiss Chocolate Bennet Bunny, the all-time favourite Caramel Eggs or the Made Without Dairy Dark Chocolate Egg, there's something to satisfy any sweet tooth. But it's not just about the eggs this Easter. Marks & Spencer's range of hot cross buns are some of its most tempting yet. From the famous Luxury Hot Cross Buns, filled with plump raisins and spices, to a gluten free alternative packed with orange soaked mixed vine fruits, orange peel and ground spices and fruity flavours like Kentish Bramley Apple, Sweet Orange Seville Marmalade and Blueberry hot cross buns – there is truly something for everyone! While those looking for something less traditional, enjoy the Salted Caramel and Chocolate Buns as well as the Mini Chocolate Hot Cross Buns.